Regular Show is one of those weird off-the-wall cartoons I discovered on Cartoon Network. It took a few episodes of me having it playing in the background before I started to really pay attention and get into it, but once I did I was hooked. My wife wasn't interested in it at first either, but after she saw a few episodes while I was watching them, she became hooked as well. And now the first two seasons are out on Blu-ray and DVD so we got to catch up on all of those episodes. And even better, every episode has a commentary track! The commentaries aren't fantastic, but they're decent enough and give a good excuse for re-watching episodes. Not like you really need an excuse to re-watch episodes, as this show is hilarious. Even the name Regular Show is funny, since it's anything but regular. 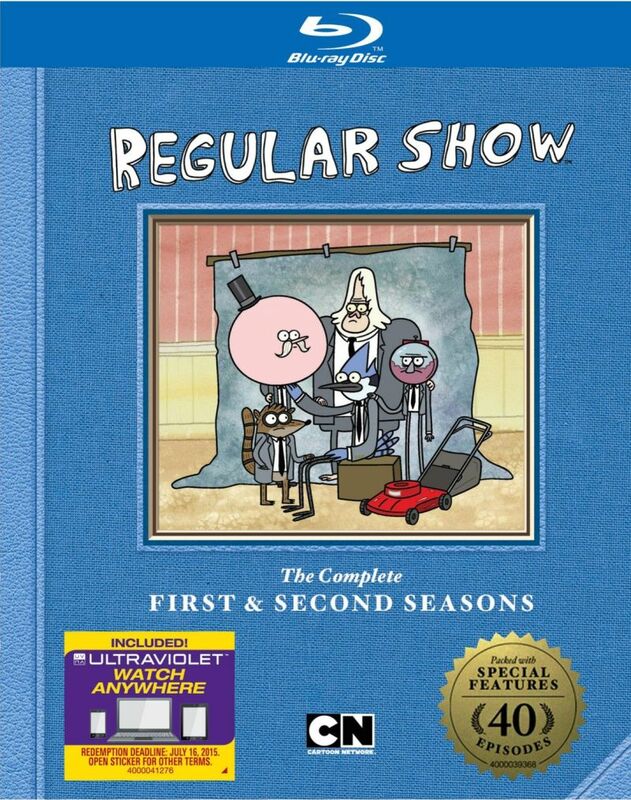 The show follows two anthropomorphic best friends, a blue-jay named Mordecai and a raccoon named Rigby. They're both a couple of slackers who work at a park managed by Benson, an anthropomorphic gumball machine. Filling out the main cast is a yeti named Skips who skips everywhere he goes, a lollipop named Pops who acts like an old-timey gentleman but who is kinda off his rocker, a ghost named Hi-Five Ghost who looks kinda like a Pac-man ghost but with a hand extending from his head, and a short fat green dude named muscle man who is always making "my mom" jokes. A bizarre cast of characters makes for a bizarre show, although the stories usually start out fairly normal before devolving into complete weirdness. For instance, the first episode has Modecai and Rigby just goofing around like many of us have done with our friends when they accidentally knock a hole in the wall. So then they decide that they need raises so they can hire someone to fix the hole, so they use a electronic keyboard Rigby stole from a wizard to put together a short little routine to ask for a raise, but they soon realize that the keyboard lets them get anything they want just by saying it in their routine so they go overboard and accidentally send Skips to the moon, then get the other guys together and go rescue him and end up fighting a moon monster. It's not just the bizarre characters and situations that make this show funny, it's also how relatable these characters are. My wife and I both thought that Moredecai and Rigby seemed like younger versions of ourselves, and I'm sure many people who watch also feel that way. It's like the creators grew up in the 80s with all the stuff we grew up with so there's a big 80s vibe in the show. In fact, in one of the episodes, they actually time travel back to the 80s! Each episode is only eleven minutes long, which I think is the perfect length. If they were any longer, I think the weirdness might just become overwhelming. As for extras features, I already mentioned the commentaries, but there's a bunch of others as well such as the unaired pilot episode and animatics for the unaired pilot and the first episode. Then there's a CG test for the Hodepodge monster, a short student file called The Naive Man from Lolliland, an interview with the creator, JG Quintel, a music video, and JG Quintel's pitch for the first episode. It's a good set of extras which round out this collection nicely.